The Harloff Medstor Max Double Column Cystoscopy Medical Storage Cart is a pre-configured, high-density storage system with the most innovative modular tray system on the market today. It provides quick and hassle-free access to medical supplies related to surgeries on the Urinary Bladder and the Urinary Tract. Sturdy and Abundant Storage. Made of 20-gauge steel, the Medstor Max Double Column Cystoscopy Medical Storage Cart has a durable, powder-coated finish with various colors to choose from. It comes equipped with trays, wired baskets of various sizes and a catheter slide shelf with three robust dual slide assemblies and five hooks for each slide. 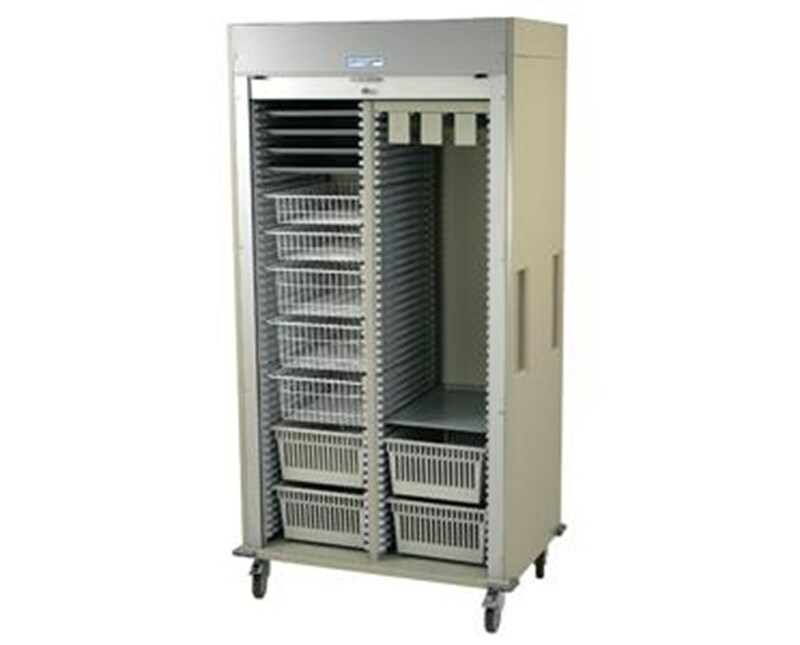 With clip-on locking adjustable dividers, the Storage Cart provides the trays optimum supply organization and can handle higher loads. 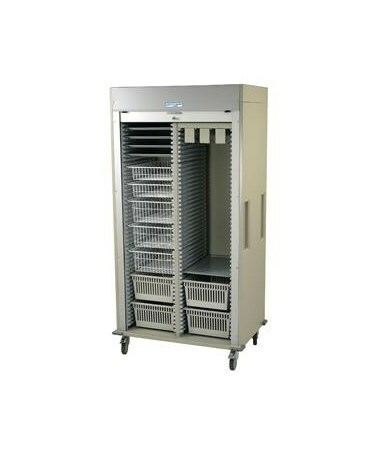 With a uniquely designed plastic side panels which feature 47 insertion opportunities to hold modular exchange trays and baskets and pull-out stoppers for trays, the items inside it can be viewed at an angle without falling off the cart. Hassle-free Movement. Mounted on 5-inch premium, full swivel casters with two that brake, the Medstor Max Double Column Cystoscopy Medical Storage Cart, with an integrated push handles are flush with the cart side, can easily be transported around the facility. Corner bumpers are installed for added protection to the cart from collisions.